Okay, there's a funny story to this one. Yesterday was very hot, so I thought to cut up some Granny Smith Apple I kept in the fridge for Little Miss Stevie and put it into a glass dish. The apple is skinned and placed in there and I took it over, let her out and put a piece on top of the cage - easily done. Well, she got bored with the first piece, so I replaced it with a second piece while holding the dish. Well, she saw the dish full of apple pieces and gave it *that look* of oooh, what's this? I held it closer thinking she was going to pick a piece out for herself. Instead, she jumped straight in, fluffed up and began rubbing herself up against all the other pieces of cool apple! OMG! Talk about hilarious! I picked her up and and put her back on the cage, but she jumped straight back in! I laughed so hard, it was difficult to get her out again... then I ran and got her bath full of water and Little Miss Stevie took a proper bath. Did she smell all apple scented? ha ha ha......mis stevie was feeling hot!! Great story, and great photo, too! Love it - I used to have a parakeet! Yeah, Little Miss Stevie! A top model. It was on the popular page! This is a great picture. 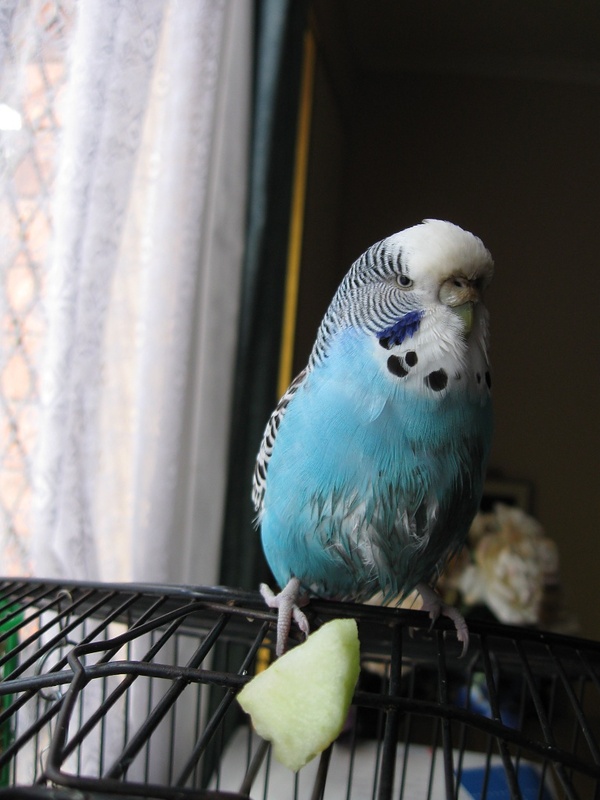 I grew up with birds and I had one parakeet with similar colorings as yours. Your picture brings back good memories. His name was Flappy and he loved parsley. Again, great photo. And broccoli! But one of my birds would just rip the broccoli off and throw it at my other bird, haha. aw, I miss my birdies. Parakeets are definitely the best!